Could you champion a bike bus? Would you like to run or join a Bike Bus? A bike bus is a group of people riding to and from a location, with timetabled ‘bus stops’ along the way, where other riders can hop on. Bike buses offer support and encouragement and help the riders feel safe. A commuter bus might run from a residential area on the outskirts of town into the town centre for the start of the working day, then back the same way at the end of it. Fear of traffic can put off less confident riders. 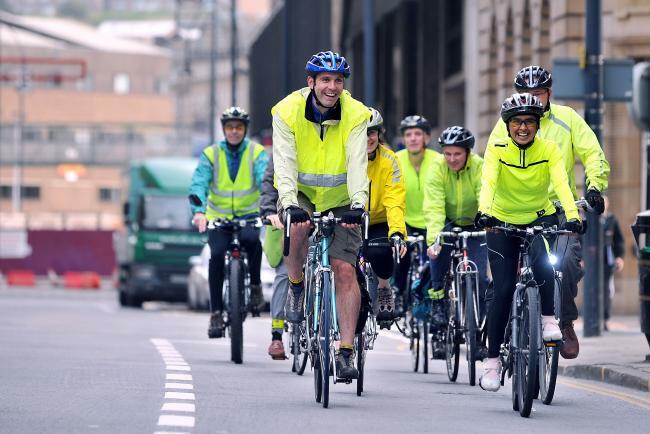 Riding in a supportive group can make a real difference to how it feels to commute. Cars give more space to a group because it tends to be more visible (and more vehicle-like) than an individual. Ideally a bus will have a leader and a deputy – more experienced riders who will help the whole group navigate the roads. The video at the bottom of the page gives a good idea about a successful bike bus called the Aire Valley Bike bus which ran for several years all the way from Keighley to Bradford and back, every Wednesday. It is not currently running but we hope this project might help to bring it back to life. Our existing bike buses and timetables are available here. Could you lead a bike bus (or act as a deputy)? If you are interested in helping develop a bike bus in Bradford we’d be really pleased to hear from you. We have some funding and staff who can support you. There is small incentive of £50 to spend on bike stuff for a ‘champion’ and £50 for a deputy of a given route plus resources to help develop the bus capacity. Capital of Cycling staff can help with leaflet printing and advertising the route, plus central administration such as putting the timetable online and dealing with e-mail or phone queries, Cycling UK insurance is available for the buses and any other reasonable items that would help get the bus off the ground. The Capital of Cycling hub would be opened especially for your arrival and you could pick up your bike again from there at the end of the day, to ride the bike bus back home. This means secure bike storage, a place to get changed and leave belongings for the day is available along with bike maintenance facilities, a kettle, signposting to cycling resources and so on in case your workplace doesn’t have these. Barriers to riding such as not knowing how to fix your bike, being unsure about clothing for bad weather or not having anywhere to store your bike when you arrive will be dealt with by the provision of workshops and resources at The Capital of Cycling hub. We plan to run a series of short workshops focussing on route planning for the buses, discussing logistics, sorting out ride leaders and so on. Contact dave@capitalofcycling.org – or ring Dave on 0774 347 1764 if you’re interested in getting involved. You don’t necessarily have to lead or be responsible for a bus to help us – even just agreeing to ride a route regularly or occasionally could be of great help, so we’d still like to hear from you. Once we have enough interest we’ll gauge when would be best to hold a workshop meeting to get these things off the ground. Bradford Cycle Club members have been of great help already and we’d welcome enquiries from other clubs and areas of Bradford. We are proposing one bus at least to run from Shipley (possibly with tributaries from Baildon and Bingley), one from Thornton, possibly Eccleshill, Osal, Wyke and so on. Wherever your area, you ought to have a good bus service! We are thinking to trial several buses for one or two days a week. We will also be offering various support sessions on a one-to-one or one-to-group basis with the general public should they be interested. Other barriers to riding such as not knowing how to fix your bike, being unsure about clothing for bad weather or not having anywhere to store your bike when you arrive will be dealt with by the provision of workshops and resources at The Capital of Cycling hub. The Confident Commuter Package project is being funded by the CityConnect Community Grants Programme. Please get in touch if you’d like to be involved!